We are delighted to be able to release our new patented multi purpose OSD system (On Site Detention System), which is designed correctly may mean you do not need a traditional OSD system at all for massive savings. This new OSD system is very innovative in that you can multi purpose they system as part of your structural retaining wall or front fence and save money in the process. The OSD system incorporates a HED (High Early discharge) tank and trash pit combined for very easy money saving installation. They system does not require footings and may be placed straight on firm ground. 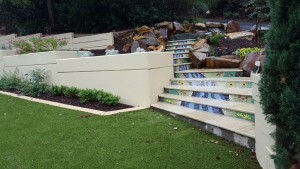 Made from 50 mpa concrete they are designed to last a lifetime. 3 mm Stainless street orifice plate to suit. Galvanized 3 mm mild steel hatch lid. Simply couple tanks together for endless storage capacity and units may be placed above or below ground. The OSD system comes with a planter top for growing plants as standard. Three sizes are available and they are available Australia wide. DWG files for downloading are on this web site. 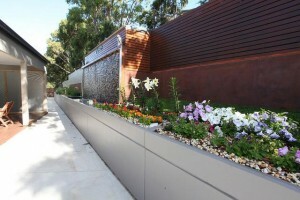 Lovely designer water tanks also acting as a structural retaining wall.